Brooke–Spiegler syndrome (BSS) is a rare autosomal dominant disease characterized by the development of multiple cutaneous adnexal neoplasms namely cylindroma, trichoepithelioma and spiradenoma. The neoplasms associated with this syndrome are generally benign, but rarely they may undergo malignant transformation. 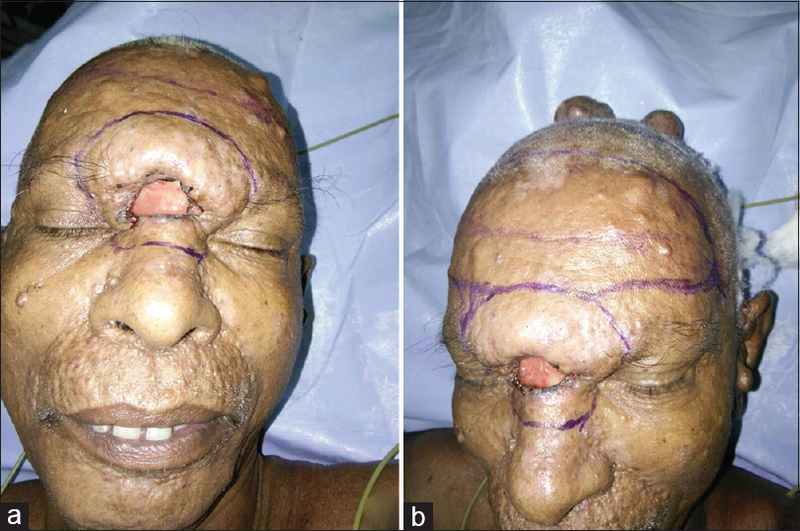 A 63-year-old male presented with an ulcerated nodular lesion over glabella and multiple asymptomatic nodular lesions over face, scalp, chest and limbs. His father, grandfather and paternal cousins had history of similar lesions. Histopathological examination revealed trichoblastic carcinoma arising from trichoepithelioma over glabella and cylindroma on the chest. With these findings we arrived at a diagnosis of BSS with malignant transformation of trichoepithelioma. Trichoblastic carcinoma arising in trichoepithelioma in a patient with BSS is extremely rare with only a single case reported in literature. Brooke–Spiegler syndrome (BSS) characterized by multiple tumors of folliculo-sebaceous-apocrine unit was first described by Ancell in 1842. This syndrome is named after two physicians who first described these neoplasms. Brooke reported on trichoepitheliomas in 1892 and Spiegler gave the description of cylindromas in 1899. More than 50 cases of BSS are reported in the literature so far. To our knowledge, this is the second case of trichoblastic carcinoma arising in trichoepithelioma in a patient with BSS. A 63-year-old male presented with an ulcerated nodular growth over glabella since one year and a pedunculated nodular growth on anterior chest wall since five years. He also had multiple papules and nodules on face, scalp, trunk, and limbs, which started when the patient was 10 years old. They first appeared on face, followed by scalp, trunk, and limbs. The lesions were gradually increasing in size and number. He had no known underlying disease, and his general condition was good. His father and grandfather had similar lesions all over the body. Physical examination revealed a nodule with ulceration over glabella [Figure 1]a and multiple smooth, firm, skin-colored, nontender papules and nodules mainly on mid-face particularly around nasolabial folds [Figure 1]b. Scalp showed multiple, smooth, firm, pink to red, dome-shaped, nontender nodules varying in size from 0.5 to 2 cm [Figure 1]b. The nodule on anterior chest wall was pedunculated. Routine blood and urine investigations revealed no abnormality. Ulcerated nodule over glabella and a nodule from chest wall were excised and sent for histopathological examination. The glabellar lesion was a skin covered nodular tissue with ulceration. Cut section showed an infiltrating gray white growth. Microscopy showed a benign neoplasm in dermis composed of horn cysts, nests of basaloid cells arranged in lace-like and adenoid patterns [Figure 2]a, and papillary mesenchymal body consisting of cup-like proliferation of basaloid cells engulfing fibroblasts [[Figure 2]a, inset], characteristic of trichoepithelioma. Adjacent to it there was an infiltrating neoplasm with a transformation zone between the two neoplasms [Figure 2]b. The malignant neoplasm showed cells in nests and trabeculae with squamous metaplasia at the centre. The cells showed nuclear atypia, mitosis, necrosis [Figure 2]c and infiltration into underlying skeletal muscle [Figure 2]d. These findings led to a diagnosis of trichoblastic carcinoma arising from the trichoepithelioma. The chest wall swelling was a skin-covered pedunculated nodular mass measuring 6 cm in diameter [Figure 3]a. Cut section was yellowish gray and lobulated [Figure 3]b. Microscopy showed a benign neoplasm in dermis composed of cells in lobules with jigsaw puzzle architecture [Figure 3]c and two types of cells, central pale, and peripheral dark cells. Lobules were surrounded by a dense, intensely eosinophilic hyaline membrane [[Figure 3]d, inset], and similar eosinophilic material was present inside the nests admixed with tumor cells [[Figure 3]d, inset]. These features favor a diagnosis of cylindroma. 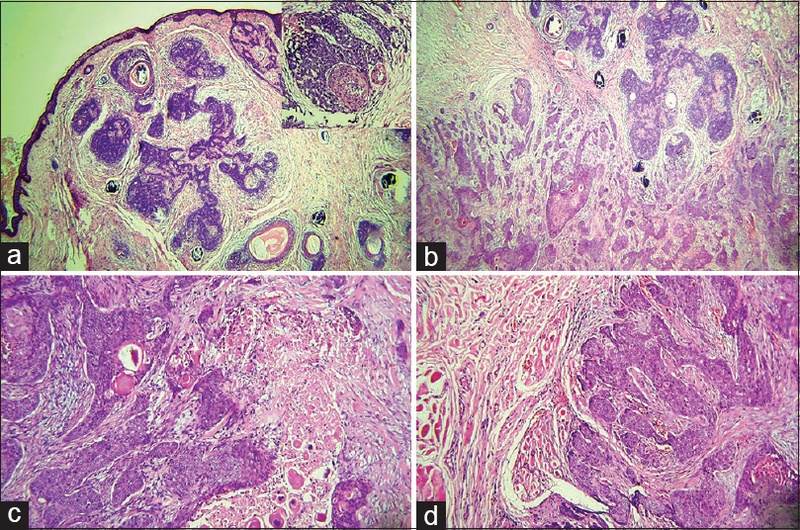 Correlating clinical features and histopathologic findings, a diagnosis of trichoblastic carcinoma arising in trichoepithelioma in a patient with BSS was made. BSS is an autosomal dominant disease characterized by multiple adnexal neoplasia particularly cylindromas, trichoepitheliomas, and spiradenomas located on the head and neck, commonly affecting women. The patient in the present case was a male. Typically cylindromas occur on the scalp while trichoepitheliomas develop on the face, particularly around the nose. Lesions usually appear at puberty or early adulthood and continue to arise throughout life, as was noted in our case. It results from mutations in the tumor suppressor gene CYLD, which results in increased expression of nuclear factor-kappa-B, leading to tumors of folliculo-sebaceous-apocrine unit. There is a predisposition to develop basal cell carcinoma, trichoblastoma, follicular cysts, organoid nevi, and malignant transformation of pre-existing tumors. Solitary cylindroma occurs sporadically whereas multiple tumors are inherited in an autosomal dominant manner, as seen in BSS and familial cylindromatosis. At an advanced stage, cylindromas form masses of numerous pink, red, or occasionally bluish nodules. When they coalesce on the scalp, they reassemble a turban and are referred to as a turban tumor. Tumors occurring in the setting of BSS are identical to their sporadic counterparts and show a jig-saw puzzle arrangement of nodules of monomorphic basaloid cells containing and/or surrounded by eosinophilic basement membrane material. The peripheral cells often show palisading and are usually darker than the cells located in the central parts of the nodules. Multifocality and presence of lesions with hybrid histopathological features may be indicative of a syndromic association. Trichoepithelioma is a biphasic neoplasm with dual differentiation towards follicular germinative epithelium and specific follicular stroma. The epithelial component is composed of bland basaloid cells arranged in a cribriform pattern and horn cysts. The stroma resembles the perifollicular sheath being composed of fibrillary collagen bundles and fibroblasts and also shows papillary mesenchymal bodies that recapitulate the dermal papillae of a mature hair follicle. Multiple familial trichoepitheliomas is a phenotypic variant of BSS characterized by the development of numerous trichoepitheliomas without accompanying cylindromas and spiradenomas. Trichoblastic carcinoma is a rare hair follicle tumor that is thought to occur from a malignant transformation of a benign trichoblastoma. The tumor arises from follicular germinative cells and develops dermal or subcutaneous fat invasion. Two of the four cases reported up to 2005 had died with metastatic disease. One of the trichoblastic carcinomas arose in the base of a trichoepithelioma in an elderly female with the BSS., Low-grade trichoblastic carcinomas are synonymous with basal cell carcinomas in some classifications. All cases of trichoblastic carcinoma have been characterized by an undifferentiated carcinoma with numerous mitoses and some necrosis. The main differential diagnosis of this malignant follicular neoplasm is a basal cell carcinoma with matrical differentiation. The principal microscopic features that favor the former are lack of peripheral palisading and retraction cleft, bulbar epithelial differentiation, nuclear pleomorphism and numerous mitosis. In summary, this case highlights the features of BSS and the rare occurrence of trichoblastic carcinoma arising from a trichoepithelioma in this syndrome. There was an apparent transitional zone between primary trichoepithelioma and malignant neoplasm. Trichoblastic carcinoma requires complete surgical excision with a margin of normal tissue. Currently there is no consensus regarding the margin size of normal tissue. Additional radiotherapy and/or chemotherapy may be used to treat metastases and for locally aggressive tumors. As excision was incomplete in our case, the patient has been put on radiotherapy and is under close follow up. Rathi M, Awasthi S, Budania SK, Ahmad F, Dutta S, Kumar A. Brooke-Spiegler syndrome: A rare entity. Case Rep Pathol 2014;2014:231895. Eldin ON, Al-Rqabah D, Ahmed EF, Al-Mutairi A. Brooke-Spiegler syndrome. Gulf J Dermatol Venereol 2011;18:52-6. Schulz T, Proske S, Hartschuh W, Kurzen H, Paul E, Wunsch PH. 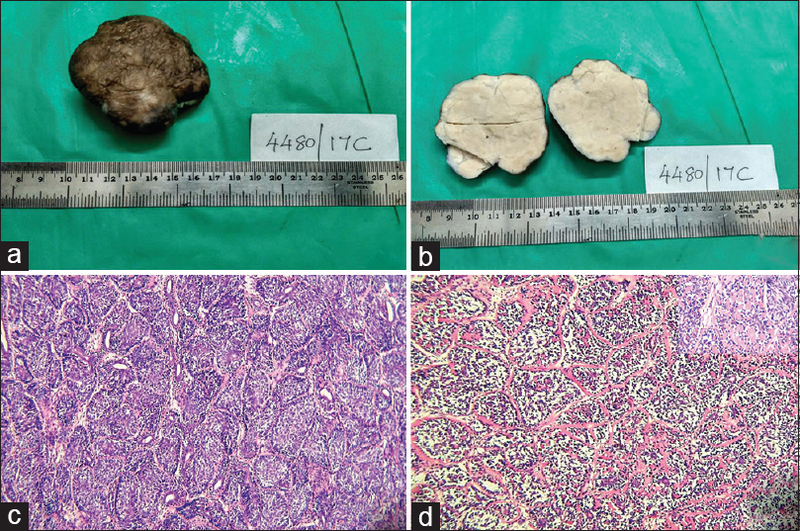 High-grade trichoblastic carcinoma arising in trichoblastoma: A rare adnexal neoplasm often showing metastatic spread. Am J Dermatopathol 2005;27:9-16. Manchanda K, Bansal M, Bhayana AA, Pandey SS. Brooke-Spiegler syndrome: A rare entity. Int J Trichol 2012;4:29-31. Doherty SD, Barrett TL, Joseph AK. Brooke-Spiegler syndrome: Report of a case of multiple cylindromas and trichoepitheliomas. Dermatol Online J 2008;14:8. Sicinska J, Rakowska A, Czuwara-Ladykowska J, Mroz A, Lipinski M, Nasierowska-Guttmejer A, et al. Cylindroma transforming into basal cell carcinoma in a patient with Brooke–Spiegler syndrome. J Dermatol Case Rep 2007;1:4-9. Kazakov DV, Soukup R, Mukensnabl P, Boudova L, Michal M. Brooke-Spiegler syndrome: Report of a case with combined lesions containing cylindromatous, spiradenomatous, trichoblastomatous, and sebaceous differentiation. Am J Dermatopathol 2005;27:27-33. Kazakov DV, Vanecek T, Nemcova J, Kacerovska D, Spagnolo DV, Mukensnabl P, et al. Spectrum of tumors with follicular differentiation in a patient with the clinical phenotype of multiple familial trichoepitheliomas: A clinicopathological and molecular biological study, including analysis of the CYLD and PTCH genes. Am J Dermatopathol 2009;31:819-27. Weedon D. Weedon's Skin Pathology. 3rd ed. London: Churchill Livingstone Elsevier; 2010. p. 763. Triaridis S, Papadopoulos S, Tsitlakidis D, Printza A, Grosshans E, Cribier B. Trichoblastic carcinoma of the pinna. A rare case. Hippokratia 2007;11:89-91.